RevK®'s rants: What's in a name? FaceBook are being a pain - they want my "authentic name". Many people think this is simple, but it turns out that a "name" is far from a simple matter. Some countries have the concept of an "official name" - one name that you have officially that the state recognises, and anything else is a nickname or false name of some sort. Some countries even have a list of approved first names, one of which you must use when naming your child! Some countries allow a name to be just one word. But in England it is not so simple. In England your name is simply what you are known as. There is no "official name". Indeed, a large proportion of the population use a different name than they had at birth, largely due to the common practice of women (and some men) changing surname on marriage. You can, of course, find all of this with a bit of googling. If you are thinking of changing your name, do not get ripped off - it is not something you have to pay for (though some bodies such as passport office may charge to issue a new document in your new name). There are some caveats, but the main one is that your name change must not be to commit fraud. It is not a way to hide from your creditors. Interestingly that web site says you have to have at least two names (i.e. first name and surname), which disagrees with some people. One thing I have failed to find while googling is whether there is any legal reason not to have more than one name. Even a passport can have also known as names on the observations page. Indeed, the passport guidelines reference the possibility of a woman that uses her husband's name and her maiden name rather than using one name for all purposes which seems to suggest that the concept of someone that does use more than one name is legally valid. It seems to me that some people are known by one name in some circles and another name in other circles and both are equally "valid". If anyone has any references, do let me know. My issue is that I am known as "Thrall Horde" to thousands of people on FaceBook, and have been for years. I don't hide that I am known as Adrian Kennard in other circles, and there is no fraud. But FaceBook are now insisting that is not an "authentic name". I am probably known as "Thrall Horde" by more people than known me as "Adrian Kennard" as FaceBook has quite some reach. So, I am pondering what to do. 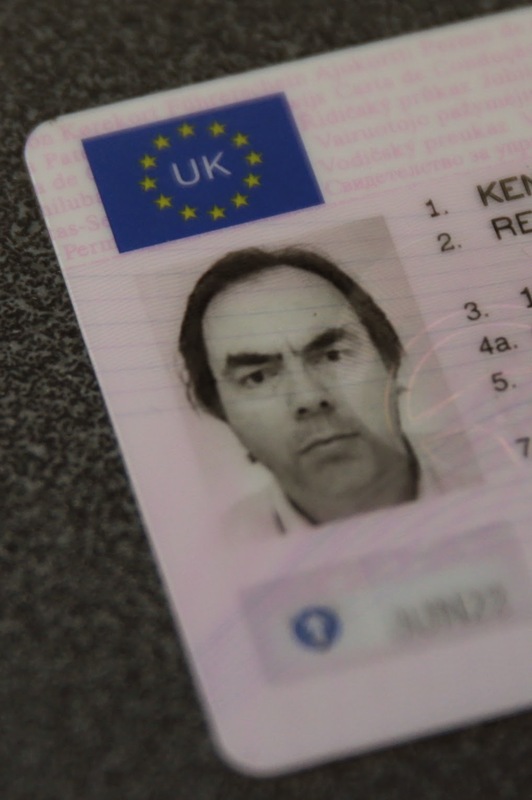 I am reluctant to just give in and put Adrian Kennard - not really my nature is it :-) FaceBook say they can accept some non-government ID documents, such two different documents from a list. Many of the items on that list I can get with any name I like with no fraud involved - i.e. I can declare that I am using that name to my employer and have business cards issued in that name (and if I like I can then declare that I am using Adrian Kennard again). 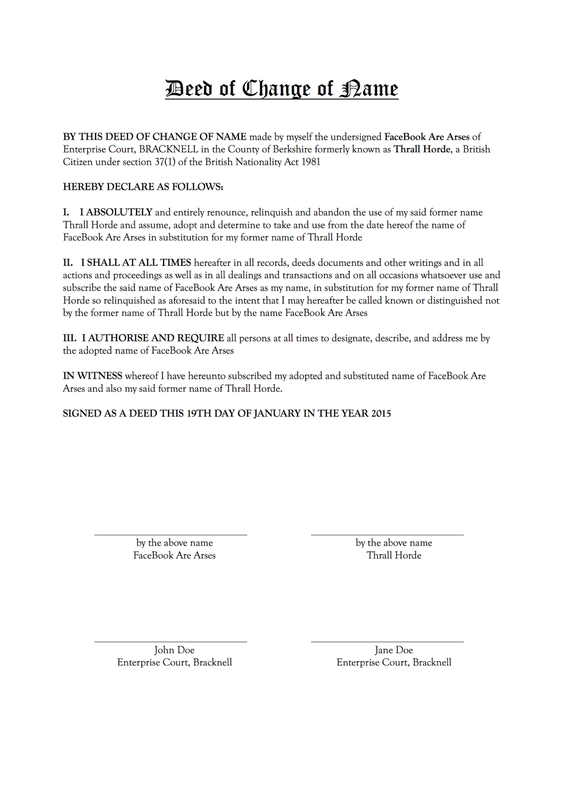 If it is legal to have more than one name concurrently if not fraudulently, I am happy to make a declaration that I am known as Thrall Horde as well as Adrian Kennard, but I think the usual wording on a deed poll is that I stop using the old name. Would be nice to know if there is case law on this. I could certainly apply to have Thrall Horde on the observations page of my passport with no problem (i.e. as a stage name). By the way, before anyone says I agreed to these terms so why am I whinging - I did not actually make the FaceBook account. Someone else did, and gave me the login details. I never read or agreed FaceBook's terms anyway. Not that it is likely to make much difference. Indeed, the "real name" thing is something I only recently heard of when the same happened to a friend of mine. I could just ditch FaceBook I guess, though I have spent nearly £2000 on advertising with them over the years, so I think it is their loss if I do. But I wonder, can I legally have two different names? Update: I may give in for now - I have to put a name in so I can cancel the paid promotion of my privacy post - not going to spend any more with FaceBook after this fiasco. How about getting a new ULC ordination certificate in the name Thrall Horde? Ha, nice one. I should make a pile of things that have that name and send a picture to FaceBook maybe. As it is, it's not your account, and the person who created it has violated the TOS, so you risk having the whole thing shut down anyway. Could you argue that "Thrall Horde" is your professional name (like a stage/screen name) and might be worth pointing the Facebook person towards a post from last year from Facebook’s Chief Product Officer, Chris Cox at https://www.facebook.com/chris.cox/posts/10101301777354543 "Our policy has never been to require everyone on Facebook to use their legal name. The spirit of our policy is that everyone on Facebook uses the authentic name they use in real life." Well, FaceBook is "Real life" and has real people with whom I interact, and they know me as "Thrall Horde" and have for many years. Shame they don't even consider age of account as having merit on that basis. Oh, and http://techcrunch.com/2012/02/15/facebook-verified-accounts-alternate-names/ may be useful to reference as well "Facebook will manually approve alternative names to make sure they’re real stage names, pen names, or otherwise established monikers for applicants" : I would say that Thrall Horde is a pen name and established monkier for you! Oh, if I go to an ORG meeting I am greeted by random people as "You're RevK aren't you" (another of my names). It's very common for artists of all stripes to continue to use their maiden name for professional purposes. My mother signs her paintings and sketches with her maiden initials, and I understand even J. K. Rowling is actually her maiden name (she married twice). It's also common for writers and actors to use a pseudonym, sometimes for necessary anonymity (eg. George Orwell), sometimes to avoid confusion with another person already using that name in the same field (I believe the relevant guild has a registry for that purpose), and occasionally just because they want a cooler-sounding name for publicity (eg. The Artist Formerly Known As The Artist Formerly Known As Prince). A previous boss's wife was a medical doctor. She'd been practicing since before she married and had published articles in journals, so to keep continuity of publishing and medical practice she continued to use her maiden name professionally. As she said at the time, it's hard enough to get taken seriously scientifically as a women in the first place without making it harder for yourself by changing name. A few years later she divorced the boss (because he was working about 100 hours a week among other reasons), and changed her name back. So sticking to one name for your professional career as a women regardless of marriage can make a lot of sense. Indeed, not uncommon, but my point is that it means someone "using" two different names. I think that is indeed valid, so need a deed poll that is not "revoke old name and use new" but "using new name as I see fit"... I wonder if such a wording is readily available and accepted. In the UK it is Equity that insist all actors (people with an Equity card) have unique names. There was already a David Williams, hence we got David Walliams. Personally this feels like a classic Closed Shop trade union of the worst kind from the 1970s (you have to join it or you can't work), but that's the way it is at present. My word you look grim on your driving licence photo. My wife is a medical doctor. At work she is Dr. , everywhere else she is Mrs. . I understand this is pretty common for doctors, in part because its an almighty pain in the arse to change your name with all the various bodies (GMC, et al), and in part because if you have publications in your maiden name its nice for people to be able to find them without you having to explicitly tell them what to search for. I think facebook have too much power and it puts me off the site somewhat - the trouble is that at the end of the day everyone on facebook is just a subscriber to a site for free so there are little if any "rights" for subscribers. > If anyone has any references, do let me know. The only one I can find quickly is a reference to the old (1985) case of Lant v. United Kingdom, which appears (from commentary in "Rights and normalization: a critical study of European human rights case law on the choice and change of names" (9 Harv. Hum. Rts. J. 269 1996, at page 278)) to indicate that the government accepts people with different names for different circumstances. So this post references laws that say "you can use whatever name you like as long as your name change is not used to commit fraud." but your previous post doesn't have lawmakers commenting a similar line "you can use whatever encryption you like, as long as it's not used to commit terrorist acts." My mother went for her entire professional life being known by her maiden name, and continues to do so now when it suits her. But she's also know by my fathers surname. My partner, who has somewhat of a taste for wedding cake, has had more surnames than hot dinners, and is currently using (still) the surname from ex -1 for some unknown reason. There doesn't appear to be any problem legally using an alias (i.e. having two names) in the UK. Interested to hear more about being able to use two names in the UK for very similar reason and purpose. Please if you get any more I would be keen to read up on it also. There's a tendency to focus on deed poll, but that's not the important bit in England. The key is whether you are known by that name. You may be known by six different names in different contexts. No problem, they are all your legitimate names. What a nice liberal principle. My sister-in-law is a neurosurgeon (I must ask her what she says when the rest of us say "it's not brain surgery"!) and when she joined the Royal College of Surgeons she had to choose the name she would always be known by professionally, and as she was still single she chose "Miss Smith" (not really!). When she married my brother she started using "Mrs. Jones" (not really!) for everything except her profession, so yes, it's absoultely allowed, and common, to have two names used for different circumstances. (Surgeons are always known as Mr, Mrs, or Miss, rather than Doctor, by the way).